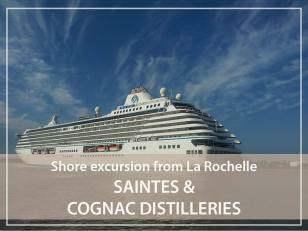 Do you plan cruise ship call in the Port of La Rochelle-La Pallice? This is a wonderful opportunity to discover the city of Saintes. This bimillennial city dispalys monuments witnessing 2 millennias of history ! Our panoramic tour of the city will be the occasion to admire the Roman remains such as the Roman amphitheatre or the Germanicus arch on the bank of the Charente river. But a rich Romanesque heritage is also here like the gate of Abbaye aux Dames or Saint-Eutrope basilica. Then we will take a drive to the Cognac vineyards (about 40 minutes). We will visit a small family distillery in the heart of the vineyard to understand everything about the double distillation process, the secrets of the Charentais red copper pot-still and the ageing in oak barrels. we could also have a walk in the old Cognac, the birthplace of François 1st with its pretty cobbled streets. on the way back we will take a photo stop at the Old Port of La Rochelle, elegantly framed by its medieval towers including the Tower of La Lanterne, which is the oldest lighthouse on the Atlantic coast.